Working with gray (or half tone) is a task that must be done with care. Gray is the middle color between white and black. In the subtractive color model, which is the case of CMYK, it is obtained by the addition of black. Therefore, the gray should be composed only of the black color in scales of its percentage, that is, any percentage between 100% and 0% of black is considered gray. Avoid using other colors (Cyan, Magenta, Yellow) to compose it. The left side illustrates the correct way to set your gray in some examples. 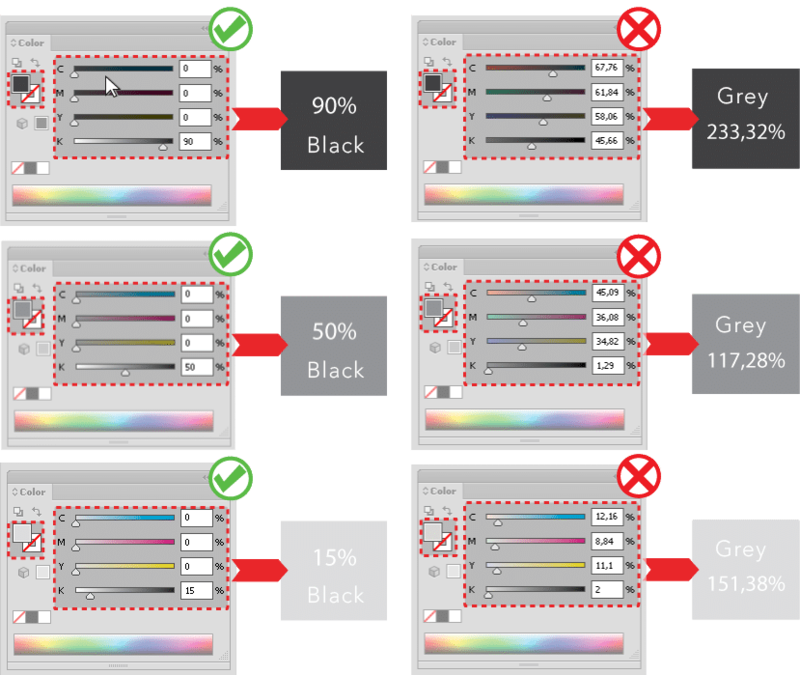 Using only the black color you guarantee that the gray areas or elements of your art will be correctly configured for printing. The right side illustrates the wrong ways to set the gray. Using colors other than black causes the gray color to become very charged. In addition, its edition becomes much more complex, because it has more than one color in its composition.